A full debrief on the men's and women's heats. Pistols made their first appearance at the Games this year in the Affiliate Cup on Day 1, and they found their way into the individual competition on Day 2. Brute strength, agility and coordination, and gymastics ability were all required for yet another challenging workout. In Heat 3, Whitney Welsch put on a clinic by hammering out easy pistols like she was doing air squats. Where other competitors were using the using the transition run as a recovery period, Welsch was sprinting end to end to the next station. She finished with 200 reps.
She was tied in the next heat by Carey Kepler, who was looking to put herself back into contention for another podium finish in 2010. Heat 5 was packed with heavy hitters, and emerging favorite Kristan Clever continued to crush workouts, taking a large lead early on. She was stalked by Annie Thorisdottir, who didn’t have much trouble with the pistols despite her height. 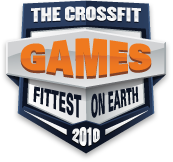 Several athletes had bandaged hands after tearing on the kettlebell swings and pull-ups on the previous event, but they gripped the bar anyway and repped out mostly unbroken sets of deadlifts. Just as in Event 2a, Clever and Thorisdottir were neck and neck, with the Icelandic crew and the SoCal supporters screaming for their athlete. Thorisdottir proved stronger and took the workout with a score of 234 to Clever’s 227. Christy Phillips also scored 227, perhaps due to her box’s programming. The weight went up for the men, but everything else stayed the same, and Spencer Hendel and James Hobart found themselves in a race in Heat 2. Hendel beat Hobart by just one rep in a thrilling finish. That score was beaten by a dynamic white-clad Austin Malleolo, who screamed through the event to a score of 242. As expected, gymnastic machine Chris Spealler was out front in Heat 5, having little trouble with the heavy deadlifts until the late rounds. 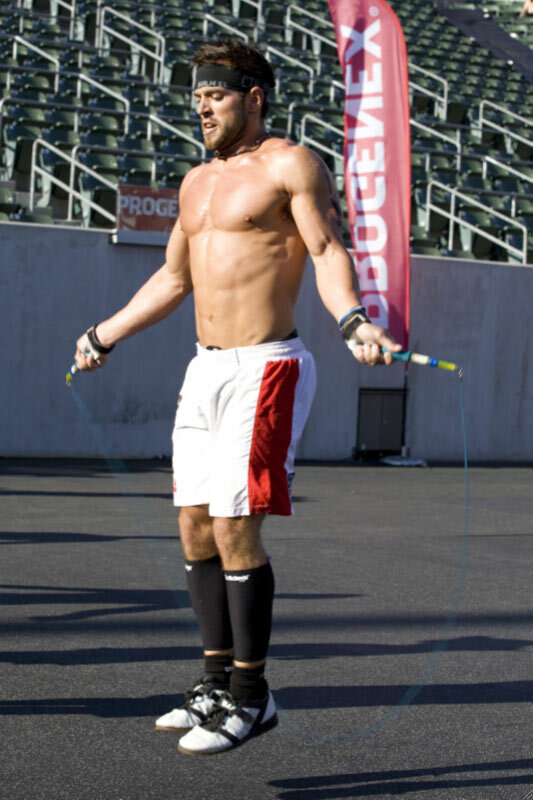 Rich Froning Jr. and Graham Holberg made up ground in the deadlifts, but lost it on the double-unders and pistols, and 2009 champ Mikko Salo fought with double-unders and fell behind early. Froning pulled away with a minute left and went on to tie with Malleolo for first. Graham Holmberg and Brandon Phillips followed in a tie with 237. One more individual event will take place tonight. Is anybody elso sick of Dave Castro as the play by play. 17 July 2010 / 9:33 p.m.
Yep... he is not exciting to watch or listen to at all. Get someone on the mic with some life to them! 17 July 2010 / 9:40 p.m.
anyone know who the judge was at station 5 during this event? he had blair morrison, jason khalipa and miko. 20 July 2010 / 10:31 a.m.
Is anybody else sick of Dave Castro as the play by play. 11 November 2011 / 7:46 p.m.